If you do not have a lot of space or a large budget, then the Hartwood 4′ x 3′ FSC Overlap Apex Shed is the right shed for you. 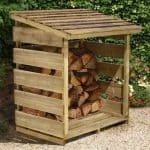 This is one very well made shed that is also very compact in its size so even gardens that are not large in their size will be able to make use of this. Even though the size may not be large, the generous height means that if you use shelving and plan your storage carefully then you could actually make this space go very far. It has a very attractive look and will be something that impresses many people when they see it. Impressively they have managed to keep the cost very low, but also made sure to use materials that are of a high quality. The walls are made from overlap cladding that is a solid 8 mm thick. This is supported by a very robust framing that is going to make sure the shed lasts for lots of years. The roof and the flooring are both made from solid sheet boarding which is just ideal for a shed like this as it greatly helps keep the costs down and it is also very strong. 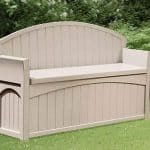 We all have things that we do not want cluttering up the house or left outside causing us to trip and do a faceplant on the garden lawn, but what if you do not have a large garden for a big shed? What if you do not want to spend a ton of money on a place for storage? Well then you are the exact kind of person that the incredible Hartwood 4′ x 3′ FSC Overlap Apex Shed is made for. 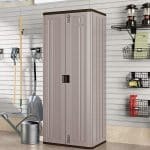 This is one of the better compact sized storage sheds that we have seen. It offers you enough room to comfortably store a few items and actually if you plan out where things will go then this storage space can actually go very far. The width is 4 feet 1 inch, and the depth is 2 feet 9 inches, so inside the shed there is not a ton of space, but certainly enough to fit some tools, gardening items and junk from the house which your other half is insisting you do something with. At over 6 feet high along the ridge, the apex roof gives you a generous amount of headroom so if you were to install shelving on the sides then you could make the storage space you have available to you go even further. The apex roof is very well made and we feel that it is also very easy on the eyes. The roof is made with solid sheet boarding which is what we would expect with a shed at this price point. This kind of boarding will be more than strong enough to take the weight of a heavy coating of snow and the boards are protected with some very good quality sand felt. We really like the classic almost rustic type of look this shed has. The reason it has this kind of style is because they have gone for overlap cladding. We really like the way overlap cladding looks, but it is also fantastic at stopping rain from getting inside and wreaking havoc with your belongings. The cladding is 8 mm thick which is more than strong enough to take the odd hit with a mower while you are cutting the grass or the abuse from the kids when they kick their football at it. We were shocked to see a 28 mm x 28 mm frame in here – not because this is a bad frame, far from it. This is one very robust and generally strong and long lasting frame. We were shocked because this is actually a very high quality frame for a shed at this price. This is going to be a shed that has a very long life and a big part of this is because of how good a frame they have used to keep it all together. The solid sheet boarding used for the floor is the same kind of boarding that is used for that well made apex roof. This is a floor that is able to take a vast amount of weight so you will be able to put heavier tools and items in here. The flooring is given a little bit of back up by the impressive floor joists that they have placed underneath it. The Hartwood 4′ x 3′ FSC Overlap Apex Shed is the same as most other budget and even more high priced sheds for that matter, when it comes to its treatment. The shed will be given a decent basecoat treatment, but it will require a full coating of treatment within a week or two of construction. Get a large and long lasting tub of treatment as the shed will require annual treatment to keep it free from rot. Impressively and generously, you will be given a ten year guarantee with this shed that as great as it is, is only valid as long as you treat the shed properly. We really like the door that they have used for this shed. To start with, even though it is a single door, you still have a very nice amount of space to get in and out of the shed. We feel that even something as large as a mower will be able to be placed in here without any real hassle. So that the door is not just flapping around in the wind, knocking people out as the walk past, a hasp and staple is used to keep this door closed and would make adding a padlock very easy. The door is going to be kept where it should be thanks to these two large black hinges which do give the front of the shed a bit of personality. No windows are included on this shed which is a little bit disappointing. We know that at this price point it is a little harsh to be critical of this, but even something simple like a styrene window on one of the sides, we feel would have been a nice touch. The hasp and staple is great, but it will not stop a thief from just opening the door and taking your stuff. Adding a padlock though is very easy and will not cost you much money at all. The shed is actually very secure and with the door closed it really is quite the strong and secure structure. We know that we said we would have liked a window on here, but the lack of windows do mean that there is no way for anyone to see the kind of things you have stored in here. If you do want to change the look of the shed a little bit then before you rush out and buy a big tub of purple paint, have a think about using a wood treatment that is coloured. The shed needs to be treated anyway and you can buy wood treatment in many different colours so you could colour the shed and treat it all at the same time. 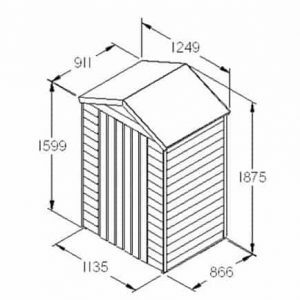 They do offer you the option to add a plastic shed base for a cost of £69.99, which is something we actually suggest you think about if this shed is going to be placed on grass. They also for a cost of £19.99, have a hasp and padlock set so you can securely lock the shed. Then there is their deluxe, shed alarm security kit which adds an alarm to your shed. This is being sold for £29.99, which we feel is a fair price. This is a shed that surprised us in a very positive way. They have done just a wonderful job in making this as high quality as they have without raising the price. With just a little bit of care and love from you, we can see you getting over 20 years out of this shed easily. They have been very smart with the selection of materials here as they have all be chosen because they will last for many years. This is one of the smallest storage sheds we have seen in awhile, but that to be fair does add to its charm. 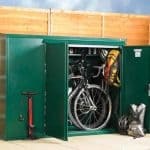 It just means that you will have to be a bit more careful when it comes to storing your items so you get the most out of the space that is being offered to you. With this being small in its stature, as long as you do what the instructions tell you, you should not have any major issues installing it. Just be sure the person helping you is not too stingy when it comes to making the coffee. 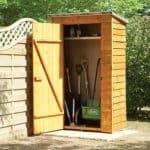 This is one very well priced shed that we have a feeling is going to be very popular. 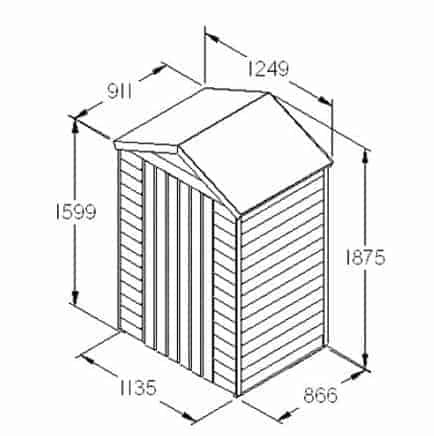 Final Thoughts: This is a compact sized shed, but that is the whole point of it so we will not put it down for its size. The Hartwood 4' x 3' FSC Overlap Apex Shed is made for those of you who do not have the space for a large shed or who just do not need one. It is being sold at what we feel is just a fantastic price and the storage space that it offers, honestly can be stretched much further than you would think. 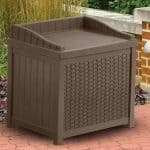 We really like the overall design and are sure that it is going to be a very positive addition to your garden. 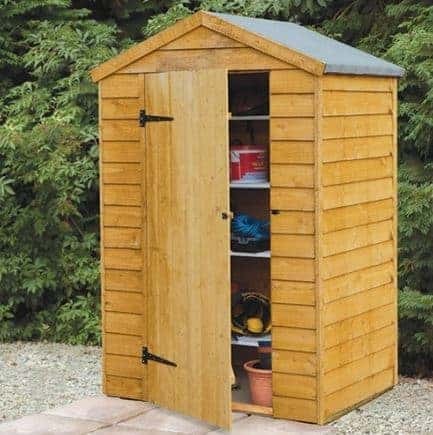 If a smaller sized shed is what you are looking for or if it is just some extra storage space for a low price then this is a shed we highly recommend.